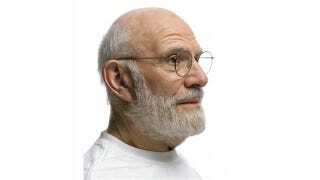 The U.K.'s Telegraph has just published a remarkably candid interview with neuroscientist Oliver Sacks. For those unfamiliar, Sacks is the colorful and highly engaging author of such books as Awakenings and The Man Who Mistook His Wife For A Hat. Known for his seemingly endless array of jaw-dropping anecdotes drawn from his work as a clinical neurologist, Sacks, now 80, has released a new book, Hallucinations, in which he reveals some of the more private aspects of his life — the details of which are quite surprising. Aside from his books, what makes Sacks such a compelling figure and thinker is that he himself suffers from some of the neurological conditions he often talks about. For example, he has prosopagnosia, a condition also known as "face blindness" in which faces are perpetually unrecognizable (including his own). He also suffers from the odd visual hallucination and is blind in one eye. And as he reveals in the Telegraph interview, it was during his "lost middle years" when he developed a fascination for bizarre neurological conditions — hallucinations in particular. Sacks believes that hallucinations are a grossly misunderstood psychological phenomenon that aren't necessarily indicative of severe mental illness or dementia. When he arrived in the US, Sacks's chosen field of medicine was already undergoing a revolution, as neurologists and psychiatrists began exploring the ways in which neurotransmitting chemicals allowed the different parts of the brain to communicate with one another. The mysteries of how drugs like LSD and cannabis worked on these neurotransmitters were at a new frontier of serious study. "Neurochemistry was plainly in," Sacks writes, "and so – dangerously, seductively, especially in California… were the drugs themselves." After taking a residency in the neurology department of UCLA medical centre in Los Angeles in 1962, he began smoking cannabis and took more LSD; he shot morphine and gobbled down handfuls of pulverised morning glory seeds, a powerful natural hallucinogen, mixed with vanilla ice cream to make them more palatable. Moving to New York in 1965, he would leave work on Friday evenings to spend the weekend on "drug holidays", gobbling down amphetamine pills, up to 400 in two days. He experienced some truly spectacular hallucinations: on one trip, he heard his parents arriving for a surprise visit, in his Topanga Canyon garden, via chartered helicopter – only to burst into tears when he realised he had imagined it all; on a massive dose of morphine, he lay in bed for 12 hours watching the Battle of Agincourt take place on the sleeve of his dressing gown; using a cocktail of cannabis, amphetamine and LSD, he successfully set out to envision a splash of true indigo, the colour he had been fascinated by since childhood. He now says that, among other things, his use of LSD may have helped develop in him the empathy that vividly animates his best case histories. But he certainly wouldn't recommend taking it. "Oh, no," he tells me urgently, as if I might have some in my pocket, ready to swallow on his endorsement. "I certainly don't recommend. I did a lot of things very foolishly – I think there was something destructive in me, and I often took high, and risky, doses." In retrospect, Sacks concedes, he may have become an addict. "I certainly had a compulsion – a dangerous compulsion with amphetamines, and a sort of insatiability," he tells me. "And if that defines an addiction, then I had it." There's lots more to this interview and I highly encourage you read the entire thing.